Chinese President Xi Jinping attends the Belt and Road Forum for International Cooperation at Yanqi Lake International Conference Center in Beijing, May 15, 2017. Chinese leaders are ramping up their ambitions for the global order. Chinese President Xi Jinping is calling for his nation to “lead the reform of the global governance system,” which is the set of international rules, institutions, and enforcement mechanisms the global community uses to solve common problems.1 As the largest global economy—China has surpassed the United States in purchasing power parity—it is natural for China to seek a stronger voice on global governance issues. However, the problem is that, within China, President Xi is rolling out new systems to strengthen authoritarian control, raising concerns that Beijing seeks to make the international system more authoritarian as well. The United States and other democratic nations need to understand Beijing’s vision for the global governance system and how that vision differs from the prevailing liberal democratic order, which recognizes limits to state authority, such as binding international law and unalienable individual rights. It is difficult to map China’s true intentions based on Xi Jinping’s international speeches, which make fuzzy promises that can be spun many different ways, such as his frequent claim that China aims to make the global governance system more democratic in order to “build a community of shared future for mankind.”2 Yet when viewed through President Xi’s domestic messaging and the actions Beijing has taken thus far to implement its global agenda, a clearer picture emerges. The current global governance system is rules-based, and it privileges liberal democratic values and standards; Beijing’s alternative vision is a system based on authoritarian governance principles in which nations negotiate issues bilaterally instead of following common rules and standards. From a liberal democratic perspective, if Beijing succeeds in bringing about that vision, the world will be less free, less prosperous, and less safe. This report aims to provide a deeper and more nuanced perspective on China’s real global governance intentions by mapping what President Xi and other Chinese leaders are saying to their domestic audience and how Chinese foreign policy scholars interpret those statements. In the Chinese political system, internal leadership statements are particularly revealing because they convey Beijing’s intentions to officials throughout the Chinese Communist Party and government hierarchy. This report will analyze that internal messaging alongside the empirical pattern of actions Beijing has taken thus far in order to assess the risks and opportunities that China’s new activism presents for the current liberal order. Deeper analysis indicates that there is ample reason for concern. China’s stated goals include watering down liberal democratic principles and either replacing or augmenting them with authoritarian ones. At the same time, this analysis also reveals that liberal democracies have powerful levers for shaping China’s actions in the global governance space. Using those levers, however, will require liberal democracies to figure out what they stand for, what they want the global order to look like over the coming decades, and how to create more space within the international governance system for China and other developing nations without ceding ground on fundamental principles. China’s reform ambitions may actually provide the impetus democracies have been waiting for to kick-start that process. Chinese analysts view the global governance system as a direct outcome of the distribution of power among nations. According to the Chinese view, powerful nations design global institutions, rules, and norms to reflect and further their own national interests. Since the United States and other Western developed nations designed many of today’s institutions in an era when China was a much weaker power, Beijing assumes that the current system benefits Western nations at China’s expense. Now that China is becoming a rival power center, Beijing expects the global governance system to increasingly reflect Chinese interests. That expectation is a legitimate one, but as this report will illustrate, some of China’s national interests conflict with broader global interests, particularly liberal democratic interests. Chinese observers view the 2008–2009 global financial crisis as the first major shift in global power from the United States to China. China’s state-directed economy weathered that crisis better than market economies in the United States and Europe, convincing many in Beijing that the Chinese model is superior to the Western one. When the dust settled, the predominant Chinese view was that the United States was declining, China was ascendant, and the global power balance had just passed a major tipping point. In a 2016 article for a leading Chinese foreign policy journal affiliated with the Ministry of State Security, Cui Liru, senior adviser to the China Institutes for Contemporary International Relations, noted the shift in the international power dynamic. He described the post-crisis era as a new world order in which the United States was “no longer able to easily exercise hegemonic authority like it did in the post-Cold War era” and power was more evenly distributed among nations with “different power centers competing and cooperating at different levels according to their own superiority and characteristics.”3 At the time, Chinese leaders were more cautious; they still viewed the world as a unipolar one with the United States at its center, but they saw it shifting toward a new multipolar configuration at an accelerating rate. In June 2018—immediately following Trump administration withdrawals from the Iran nuclear deal and the U.N. Human Rights Council—President Xi delivered a major foreign policy speech in which he stated that China would “lead the reform of the global governance system.”9 That speech marked Beijing’s first official deviation from the “never claim leadership” principle Deng Xiaoping established in 1989 when laying out the regime’s post-Tiananmen survival strategy.10 The global governance actions China has taken thus far—which are outlined in this report—largely predate Xi’s June 2018 speech. Going forward, the international community should expect China’s ambitions and activities to increase substantially, particularly if the United States continues to disengage from the multilateral arena and provide maximum maneuvering room. When President Xi and other Chinese leaders outline their global governance vision for an international audience, they do not provide much detail. That is partly to avoid triggering international concern and partly because there are divergent views in Beijing regarding where the current system benefits China, where it disadvantages China, and how and where Beijing should push for reform. Although debates continue at the margins, three key macro-level themes are emerging in China’s internal discussions, and those themes are increasingly reflected in Chinese foreign policy. Chinese leaders recognize that in order to continue advancing economically, they cannot wall off China’s economy or society from the global community. However, integrating with a global system that values liberal principles over authoritarian ones brings sizable risk, because it exposes Chinese citizens to a set of ideals, standards, and benefits their current leaders do not intend to meet or provide. To address this risk, Chinese leaders are seeking to make the international system more like China. This is the opposite of what Western nations intended when they brought China into that system. In the United States and other Western nations, there is a tendency to avoid framing disputes with China in ideological terms, which is generally viewed as veering toward dangerous Cold War thinking. On the Chinese side, however, Chinese leaders frequently claim that their nation is fighting an ideological battle against Western values—particularly freedom, democracy, and human rights—which, from a Western perspective, are universal values that should apply equally to all citizens. As a repressive authoritarian regime, Beijing does not want Chinese citizens to judge their own leaders using those standards. Where those standards exist in the global governance system, Beijing views them as a fundamental security threat. President Xi outlined those fears at the 2013 National Propaganda and Ideological Work Conference in Beijing when he described Western nations as “hanging up a sheep’s head while selling dog meat.”11 By that, he was intimating that Western nations were engaging in false advertisement, making self-righteous claims about promoting universal values for the sake of humanity when their real purpose was, in his words, “to fight with us for positions, fight over the will of the people, fight over the masses, and ultimately overthrow the leadership of the Communist Party of China.”12 A few years later, at a 2015 work conference at the Chinese Communist Party Central Party School, President Xi warned that among nations who fall for the universal values trap, “some have been tormented beyond recognition, some have split up into pieces, some have been enveloped in flames of war, some are noisy and in disarray all day.”13 He pointed to Syria, Libya, and Iraq as prime examples. Moreover, Zhang argues that the same dynamic applies at a global level: The Chinese model can effectively address complex problems that a democratic policymaking process cannot. Since he views the Chinese model as superior, Zhang calls on China to put forward “a series of Chinese solutions to difficult issues in global governance.”22 When President Xi calls for a “community of common destiny for mankind,” he is pushing a new vision for global governance in which the state, not the individual, is always the ultimate authority. Yet despite these lofty promises, in practice—as the empirical examples in this report will demonstrate—China’s behavior often leans more dictatorial than egalitarian, reflecting the same hegemonic behavior China’s scholars associate with U.S. leadership. As the largest global economy, China is heavily dependent on the global system. Therefore, it is in China’s national interest to work collaboratively with other nations to address challenges that threaten global safety and prosperity. On issues such as climate change, terrorism, pandemic disease, nuclear proliferation and global financial crises, China shares common interests with other nations, and that is something Western nations should not forget as they assess China’s global governance ambitions. Where there are common interests, China’s growing capabilities can present more opportunity than risk. China’s economic might is its primary lever for global governance reform. Other nations want access to China’s domestic market or outbound investment, and Beijing can provide or withhold that access to exert leverage over other nations. China’s development success provides additional political capital. Leaders in other developing nations—particularly those that do not want to pursue liberal reform—seek to emulate the China model. Under Xi Jinping’s leadership, China is augmenting those positive drivers with coercive power: extending its military and security services overseas to apply targeted pressure against nations or individuals who, in Beijing’s view, undermine Chinese interests.33 Beijing mixes these capabilities—economic, political, and coercive—to pursue its national interests in the global governance space. Those actions cover six key categories: (1) shaping multilateral action; (2) disrupting international legal regimes; (3) shifting international norms; (4) co-opting international organizations; (5) creating new international institutions; and (6) building a China-centric platform for international cooperation. Chinese leaders are willing to take a flexible approach on noninterference when they begin to suspect that by blocking multilateral action, China is increasing the risk that other nations will form military coalitions or take unilateral military action to address the crisis. In this respect, Beijing is more flexible on noninterference than on issues relating to universal values. During the Obama administration, China shifted its position on Iran’s nuclear program, eventually supporting strong sanctions designed to bring Iran to the negotiation table.39 Beijing feared that strong sanctions could destabilize the Iranian regime but also had deep economic interests in the region and feared that, if Iran continued down the nuclear path, other nations—particularly the United States and Israel—were likely to react militarily, threatening China’s economic interests. China demonstrated a similar pattern on North Korea in 2017, backing stronger multilateral sanctions once it perceived a growing risk that the United States would respond militarily. This approach clashes with the international legal system. When nation-states sign treaties and other forms of binding international law, they are expected to abide by them, even when doing so conflicts with certain national interests. The United States and other Western nations agree to be bound by international law because doing so enables them to exist within a stable, secure, and predictable international environment. China has demonstrated a concerning pattern whereby it reaps benefits from that environment but flouts laws that go against China’s national interests. Unlike democratic norms, China is generally content to leave international legal regimes in place, but China sometimes violates those regimes in ways that undermine them from within. China’s compliance with the World Trade Organization (WTO) is one prominent example. When China signed its WTO accession agreement, Beijing made multiple commitments—many of which are still unmet nearly two decades later. For example, China has refused to file WTO-required subsidy reports and continues to force foreign firms to hand over core technology as a prerequisite for Chinese market entry, despite the fact that it is the only WTO member with instructions to eliminate and cease enforcement of “technology transfer requirements” in its accession agreement.42 When foreign firms try to use WTO dispute resolution procedures, Beijing threatens to kick them out of its markets entirely. Many firms are so fearful of Chinese economic retaliation that they never even bring complaints to the WTO. China also waters down domestic regulations in order to make it harder for foreign firms to use them as evidence of WTO-illegal action. For example, after multiple nations complained about forced technology transfer, Beijing revised those rules to make transfers voluntary but, in practice, still made transfer a mandatory requirement for market access. That pattern of action undermines the entire rules-based trading system. When other nations confront China, Beijing either denies violating the rules, argues that the rules are unfair, or claims that the rules should not apply to China. For example, in current discussions regarding WTO reform, Beijing is calling for reforms to be “jointly formulated by the international community, not dictated by a small number of members”—a clear dig against the current system.43 Last fall, Wang Shouwen, China’s deputy international trade representative spoke at a Ministry of Commerce press briefing, declaring that, “China is willing to assume its obligations in the WTO according to its own level of development and capabilities and does not allow other members to deprive China of the developing member special and differential treatment it ought to enjoy.”44 In other words, China wants to enjoy the same global market access as everyone else, but it does not want to be held accountable to the same rules and standards. In the security arena, China is deploying a similar strategy to undermine the U.N. Convention on the Law of the Sea (UNCLOS). The convention states that when there is a dispute among signatories regarding how the convention should be applied in a specific case, either party can bring that dispute to a U.N. tribunal, and the tribunal’s ruling will be legally binding. In 2013, the Philippines used that mechanism to challenge Chinese maritime claims in disputed areas of the South China Sea.45 China first responded by arguing—contrary to conventional international law—that the dispute was a bilateral matter, and as such, the UNCLOS tribunal did not have legal authority to issue a binding ruling. China’s national cabinet called the Philippines use of established legal practice a “wanton abuse of the UNCLOS dispute settlement procedures” and stated that the Philippines was engaging in an “invasion and illegal occupation” of Chinese territory.46 China further claimed that the Philippines had “concocted a pack of lies” to convince an UNCLOS tribunal to hear the case.47 When the tribunal ruled against China, Beijing stated that China believes “the will of sovereign states should not be violated” in international dispute settlement, and “on issues concerning territory and maritime delimitation, China does not accept any means of dispute settlement imposed on it.”48 In other words: The Chinese state is not bound by international law and will not respect international rulings that violate its will. The common thread throughout both the WTO and UNCLOS examples is that China enjoys the benefits of being a part of international legal regimes, but when those regimes rule against China or seek to constrain Chinese actions, Beijing does not accept constraints on its own behavior, which, in turn, undermines the entire system. International norms pose unique challenges for China, particularly those that promote universal values such as freedom, human rights, and democracy. The very existence of those norms is a problem for the Chinese Communist Party because they set governance standards the party does not intend to meet. Beijing is particularly concerned about norms relating to human rights and internet freedom. On both fronts, Chinese leaders are working to modify those norms by promoting a more authoritarian interpretation that balances individual interests with state interests, which, in China’s case, is primarily the desire to maintain single-party political control. China is convening its own multilateral forums to promote that shift, as well as working within existing multilateral institutions. In 2017, Chinese leaders brought together 50 developing nations to attend China’s first South-South Human Rights Forum in Beijing, which articulated a Chinese alternative on human rights. President Xi outlined that alternative in his opening letter to the forum, which defined human rights as having both “universality and particularity,” stating that “human rights must and can only be promoted in light of specific national conditions.”53 Foreign Minister Wang Yi echoed this messaging in his address, stating that China follows a “human rights development path with Chinese characteristics” that, unlike the Western version, has a more balanced “combination of universality and particularity.”54 Forum participants adopted a Beijing declaration, which gives states the authority to balance human rights against other needs, particularly public order. The declaration states that national governments can legitimately violate human rights—or, as the declaration puts it, impose “restrictions on the exercise of human rights”—as long as the measures they take to do so “meet the legitimate needs of national security, public order, public health, public safety, public morals and the general welfare of the people.”55 In other words, human rights with Chinese characteristics are privileges that a state can provide or deny. Within the United Nations, Beijing is blocking efforts to criticize its human rights record and is working to water down accountability mechanisms.56 China recently put forward two resolutions at the U.N. Human Rights Council: a June 2017 resolution suggesting that human rights must be balanced with economic development needs, and a March 2018 resolution that calls for nations to address human rights problems through “mutually beneficial cooperation.”57 The March 2018 resolution further states that when assessing a nation’s responsibilities in the human rights domain, “the significance of national and regional particularities and various historical, cultural and religious backgrounds must be borne in mind.”58 Both resolutions passed, thus baking Chinese-style norms—which give states leeway to abuse human rights in their pursuit of other interests—into the U.N. system. China is seeking to devalue those external freedoms by pushing authoritarian principles in global internet governance forums. Just as China is convening its own human rights forums, it is also hosting World Internet Conferences that bring in representatives from other nations—including major U.S. companies—to legitimize Chinese norms. In his speech to China’s second World Internet Conference in 2015, President Xi pushed a set of principles for global internet governance reform that included “respect for cyber sovereignty,” “maintenance of peace and security,” and “cultivation of good order.”61 President Xi stated: “We should respect the right of individual countries to independently choose their own path of cyber development, model of cyber regulation and Internet public policies … No country should pursue cyber hegemony, interfere in other countries’ internal affairs or engage in, connive at or support cyber activities that undermine other countries’ national security.” 62 In other words, states have the right to control internet activity within their borders, and other nations should respect that right. China’s normative push in the internet domain is a particular concern because it has an infrastructure component: Beijing is building digital infrastructure in developing nations and providing regulatory training as part of the package. China’s Belt and Road Initiative includes a “Digital Silk Road” that brings officials from Belt and Road nations to China for workshops on information and communication technology (ICT) policy, including internet control.67 Some of these nations are applying those lessons at home. (See text box below) If China successfully expands the set of countries following its approach to the internet, there will be a growing base of support for China’s “cyber sovereignty” principles in global governance forums. As a member within existing international organizations, China generally operates within the rules and therefore can be said to conform to the existing system. For example, at the International Monetary Fund (IMF), at the World Bank, and across multiple U.N. organizations, China uses organizational rules to pursue its objectives, just like any other nation. As Chinese nationals begin to hold key leadership positions, however, a concerning pattern is emerging. The Standards of Conduct for the International Civil Service provide common guidelines for individuals who serve as leaders or staff in international institutions. Those guidelines state that international civil servants such as World Health Organization (WHO) employees must serve their organizations independently, and “in keeping with their oath of office, they should not seek nor should they accept instructions from any Government, person or entity external to the organization.”93 China frequently violates these standards. When Chinese nationals occupy leadership positions in international organizations, Beijing leverages those individuals to co-opt the institution and push narrow Chinese political objectives, particularly on the issue of Taiwan. Current and former Chinese government officials have used their leadership positions at the International Civil Aviation Organization (ICAO) and the WHO to diplomatically isolate Taiwan. During Fang Liu’s term as ICAO secretary general, the organization stopped inviting Taiwan to attend its assembly; ICAO Communications Chief Anthony Philbin reportedly told Reuters that “ICAO follows the United Nations’ ‘One China’ policy.”94 After two Chinese nationals—Ren Minghui and Zhang Yang—assumed leadership positions at the WHO, the health organization stopped inviting Taiwan to the World Health Assembly, where Taiwan had previously held observer status.95 According to the Chinese Ministry of Foreign Affairs, in Beijing’s view, China has sovereign authority over Taiwan and can therefore determine when Taiwan should be allowed to participate in international organizations. The ministry states that Beijing will make that determination “in the light of the nature and statutes of the international organizations concerned and the specific circumstances.”96 The problem is that, as the standards of conduct stipulate, individual Chinese nationals should not leverage civil service leadership positions to implement national policy at a global level. This pattern regarding Taiwan raises concerns that, as more Chinese nationals gain leadership positions in the international civil service, Beijing may leverage those positions to push Chinese government priorities on other issues as well. Beijing has also led the creation of two new multilateral development banks: the Asian Infrastructure Investment Bank (AIIB) and the New Development Bank (NDB).97 Thus far, both are largely positive contributions to the global governance arena. To be sure, there are persistent concerns regarding lending standards. For example, both the World Bank and the Organization for Economic Co-operation and Development (OECD) have agreed to limit financing for high-emission coal-fired power plants, whereas the AIIB and NDB have not.98 Overall, however, the projects China supports through these two institutions are more transparent and more likely to adhere to high environmental, financial, and social governance standards than the projects China funds directly through its state-run development banks. In 2016, China launched the Beijing-based AIIB with the support of 57 member nations. The United States initially tried to convince the United Kingdom and other major industrial nations to boycott the initiative, but that attempt failed.99 AIIB membership has since grown to 93 nations. The United States and Japan are the only major industrial powers that have not joined. Beijing initially intended to maintain majority control over the bank—giving it the ability to unilaterally set the bank’s financing agenda—but member nations demanded a more equitable arrangement.100 At the official launch, China’s share was 29 percent; it is now 26.5 percent due to the subsequent increase in membership.101 As of January 2019, the bank has approved 34 projects.102 Of those, at least 60 percent are co-financed with other major multilateral development banks, such as the World Bank.103 European member nations report that the bank’s governance structure gives them an invaluable platform to influence China’s overseas development agenda and push the AIIB to adhere to higher project standards. Domestically, when Beijing calls for harmony, that is code for uniformity: Chinese citizens should not voice opinions that conflict with the Chinese Communist Party line. Beijing appears to interpret Belt and Road harmony in a similar manner: Partner nations receive Chinese economic benefits, and in return, they are expected to support Chinese political objectives. Those that do not comply are likely to face economic punishment. For nations who are deeply in debt to China, that punishment can be catastrophic. From a liberal democratic perspective, if Beijing achieves its systemic-level reform objectives, the future global governance system will be less free, less prosperous, and less safe. At the same time, democratic nations should not seek to eliminate China’s voice or contributions in the global governance arena. As the largest global economy, China has an outsized responsibility and capacity to contribute, and it is natural for China to expect a seat at the table. The challenge is figuring out how to create space for China in ways that do not undermine the prevailing liberal democratic system. Doing so will require coordinated action among liberal democracies that share an interest in protecting that system. That coordination is not yet happening. Under President Trump’s leadership, the United States is leaning out at the multilateral level, creating a leadership vacuum that China is stepping in to fill. The White House’s 2017 National Security Strategy (NSS) states that “China and Russia want to shape a world antithetical to U.S. values and interests,” describing a zero-sum battle for influence in which the United States should seek to counter Chinese initiatives on every continent.118 For example, on infrastructure development, the strategy states that “China and Russia target their investments in the developing world to expand influence and gain competitive advantages against the United States,” and as such, the United States should find ways to pull nations out of China’s orbit.119 That framing overlooks the global governance system altogether, as well as the fact that the global community needs Chinese contributions on global challenges. At a time when Chinese President Xi Jinping is engaged in a massive global charm offensive that includes promises to increase China’s contributions to the global community and build a more democratic, diverse, and functional global order, the current U.S. approach is to ignore the global governance system in some areas, actively undermine it in others, and lecture other nations on their naivete about China. Unlike the United States, European nations are Belt and Road partner nations, and that heavily influences how they view China’s broader global governance agenda. European experts report that right after the global financial crisis, EU nations were desperate for investment and welcomed China’s Belt and Road Initiative without reading the fine print. By 2018, however, they were growing increasingly concerned about the downside risks. In particular, European counterparts report that China is offending EU states with Belt and Road memorandums of understanding that require them to endorse a Chinese worldview without getting much in return. They see normative battles happening at the regional level, where China is leveraging investments in cash-starved European nations to divide the EU over key issues. The experts interviewed cited examples such as Greece, Hungary, and Croatia’s opposition to a strong EU joint statement on the July 2016 UNCLOS South China Sea tribunal ruling and Greece successfully blocking a joint EU statement on China’s human rights abuses at the United Nations in 2017.121 European experts also report increasing “fatigue” due to unkept Chinese promises—even in Eastern Europe, where poorer nations are more likely to be pro-China.122 In April 2018, Hungary was the only EU member nation that did not sign a joint letter to Beijing sharply criticizing China’s Belt and Road Initiative.123 European experts view the letter’s broad support—even Greece and Croatia signed, despite previously objecting to a sharp UNCLOS statement—as evidence that the tide is turning. However, whereas the United States is currently seeking to counter the Belt and Road Initiative and other Chinese initiatives in a zero-sum fashion, European nations see an opportunity to shape these initiatives. In particular, they are pushing Beijing to make the Belt and Road Initiative more rules-based, more transparent, and more in line with high environmental, financial, and social governance standards, which currently is not happening. Individual nations are pushing China to improve its approach in different ways. For example, President Emmanuel Macron describes the current framework as an unacceptable “new hegemony” and states that France welcomes the Belt and Road Initiative if it is reciprocal, providing market access in China for French companies that is on par with the access China seeks in France.124 European nations are taking lessons from the AIIB: Instead of vetoing the program, they are joining it but imposing conditions and seeking to shape its direction. 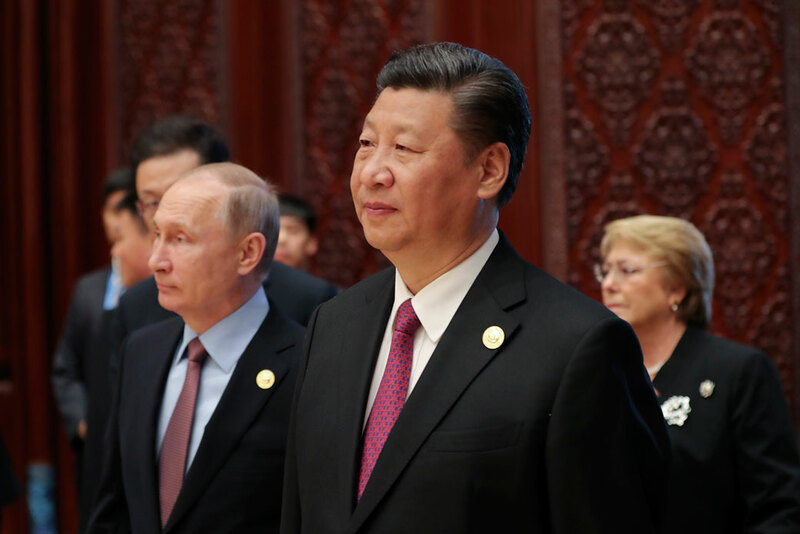 Across the board, the European experts interviewed for this report view the current U.S. policy as making it harder to marshal an effective democratic response to China’s global governance reform push. At a multilateral level, U.S. retreat makes it harder to address common global challenges and gives China a new platform for exerting influence. For example, on climate change and Iran, multiple experts reported that China is now the primary EU ally, not the United States. When China is the superpower saving the world in the face of U.S.-induced disorder, it has more political capital to push its reform objectives at the system level—many of which aim to undermine liberal democratic norms. Going forward, democracies need to find a way to articulate a like-minded vision on global governance issues. The current empirical pattern suggests that, without a common liberal democratic vision, China will bring about a major shift in the global governance system. The challenge is daunting, because it requires democracies to not just defend the status quo but find ways to make the global governance system more representative—that is to say, more inclusive to developing economies—and more response to today’s challenges. Global norms are powerful levers. Beijing would not be obsessed with universal values if the very presence of those norms in the international arena did not constrain its actions and ambitions at home and abroad. Currently, the international community has been indecisive and is allowing China to reshape those norms in ways that legitimize authoritarian governance. Going forward, liberal democracies must figure out what they stand for and, when Beijing challenges those values, mount a collective and strategic response. China values international prestige. The fact that Chinese leaders wrap their global governance initiatives in positive international rhetoric indicates that China values international prestige and is seeking a favorable reception on the global stage. That is why President Xi uses fuzzy concepts such as “common destiny for mankind” when speaking to international audiences and reserves his fiery speeches on zero-sum ideological battles for internal party and government forums. Going forward, liberal democracies should not continue allowing China to describe its intentions one way internationally and another way domestically. The international community should engage China in a deep debate regarding what Beijing actually means when it uses concepts such as “democratic international relations,” “harmonious family of Belt and Road nations,” and “common destiny for mankind.”127 Western observers tend to dismiss such rhetoric as empty Chinese propaganda and allow Beijing to bake these terms into international governance forums—such as the U.N. Human Rights Council—without questioning or challenging them. This is a mistake. From a Chinese perspective, these terms define the nation’s intentions on global governance reform and forecast the actions China plans to take in future. Over the past few years, China’s rising ambitions have produced a pattern of empirical actions that other nations can use to push Beijing to explain exactly how Chinese actions do or do not support common global objectives such as peace and prosperity. Other nations can then use China’s desire for international prestige to either shape Chinese initiatives—by holding Beijing accountable to its lofty promises—or rally the global community to push back against problematic actions. The Asian Infrastructure Investment Bank provides evidence that China’s ambitions can be shaped in positive ways, particularly when those ambitions are channeled through formal multilateral institutions that give other nations a strong platform to monitor Chinese actions and hold Beijing accountable to its promises. Liberal principles have an edge over authoritarian ones. Transparency creates a key dividing line between liberal and authoritarian principles. In general, transparency strengthens actions based on liberal democratic principles and undermines, unwinds, or blocks those based on authoritarian tenets. That gives liberal democracies a powerful tool for shaping Chinese global governance initiatives. Improving transparency—for example, by giving local citizens and the global community more information about the terms of China’s Belt and Road loans—makes it much harder for Beijing to sell negative actions as positive ones and extract diplomatic and political concessions in return. For this approach to work, democracies must be willing to accept similar scrutiny. When the authors broached policy ideas regarding cross-border infrastructure transparency in Western Europe, some European counterparts pointed out that, just like China, some EU nations—including Germany—are financing dirty coal plants in the developing world, and those states are therefore reluctant to push for tough transparency conversations regarding China’s Belt and Road Initiative. In sum, China’s ambitions toward global governance reform pose both risks and opportunities for the global community. On the positive side, China has huge incentives to work collaboratively with other nations to solve global challenges. As the largest global economy and one heavily dependent on global integration, China is deeply affected by problems such as climate change or pandemic disease. It has a growing capacity to help address those problems, and that is something the United States and other nations should support. On the negative side, when it come to the global governance system—the set of rules, norms, and multilateral organizations that guide collective global efforts—China’s reform ambitions are problematic. The current global governance system is rules-based, and it privileges liberal democratic values and standards. Beijing’s alternative vision is a system based on authoritarian governance principles in which nations negotiate issues bilaterally instead of following common rules and standards. From a liberal democratic perspective, if Beijing succeeds in bringing about that vision, the world will be less free, less prosperous, and less safe. Fortunately, democracies still have substantial leverage to shape China’s global governance reform agenda. Utilizing that leverage, however, will require democracies to clarify exactly what they stand for and how that stance differs from China’s authoritarian governance vision. Just as importantly, it will require democracies to work collaboratively to create more global governance space for China and other developing nations in ways that do not undermine key aspects of the current international system. Melanie Hart is a senior fellow and director for China Policy at the Center for American Progress. She is responsible for formulating CAP policy proposals on China and U.S.-China relations and leading CAP efforts to promote those proposals with political leaders in the United States and Asia. Dr. Hart’s research focuses primarily on China’s domestic political trends, U.S.-China trade and investment, Chinese foreign policy engagement in Asia, and U.S. foreign policy toward China. She founded and leads multiple U.S.-China Track II dialogue programs at CAP and frequently advises senior U.S. political leaders on China policy issues. She has a Ph.D. in political science from the University of California, San Diego and a B.A. from Texas A&M University. Blaine Johnson serves as a policy analyst for National Security and International Policy at the Center for American Progress. She focuses on China and Asia policy, with an interest in energy, and frequently conducts research trips in the region. Previously, Johnson worked in government relations in Shanghai and on policy analysis for Fudan University’s Sustainable Behavior Research Group. She received her master’s in public administration from Fudan University, where she was a James B. Reynolds scholar, and graduated with a bachelor’s degree from Dartmouth College.